Galen Carpenter's hand-turned, segmented wood vessels have the formal purity of classical pottery and the sophistication of fine furniture. Galen Carpenter's forms are what first capture your attention. Graceful, elegant, perfectly balanced, they are strangely compelling. Although you could swear you've seen some of them before, you haven't: each one of Carpenter's vessels is unique, and of his own design. People who view his work often wonder aloud where he finds his pieces' beautifully proportioned curves. "I probably shouldn't be telling you this," Carpenter confides. The Sedona, Arizona, woodworker removes a fan belt from the wall of his garage-turned- workshop and walks out the door. He twists the belt, stretches it, relaxes it some. He angles it to the light. "There's a pretty good bowl right there," he says, looking not at the belt but at the shadow it casts on his driveway: a gracefully rounded form. Carpenter stretches the belt again and changes its angle, elongating the shadow. "Now there's a long-necked bowl," he says. "Some days I sit out here all morning. When I see something I like, I trace it on the cement with chalk." In his kitchen, over lunch, he elaborates. "I've never had a design class in my life," he says. "But I can see things that most people don't. The curve of the leg of the chair you're sitting in-now that could be the bottom part of a bowl. Technically, if I can get a shape on paper, I can make it. But if you're just a little bit off, it totally changes the character of the whole bowl." Turning - spinning a piece of wood and shaping it with hand-held chisel - has been practiced since prehistory. Early turners spun wood by wrapping a cord around the work and pulling it back and forth. Although inefficient-the turner could apply the tool to the wood only half the time, while it was spinning for-ward- such lathes were used for centuries to make bowls, uten-sils, tool handles, and furniture. During the Industrial Revolution, power lathes that could quickly and automatically reproduce a given design were invent-ed. Since then, the simple craftsman's lath-now driven by an electric motor, but otherwise largely unchanged-has remained chiefly a tool of hobbyists. Carpenter is well on his way to developing the ancient craft of turning into an art. His vessels have all of the refinement of, say, hand-blown glass or fine pottery-media with which his work is at times confused. He is entirely self-taught in both design and turning technique. Although he spends about a third of his time selling his work (priced from $400 to $4,500) atjuried crafts shows nationwide, "I shelter myself from other people's work," he says. "If you're not looking to other people for ideas, you go through a natural evolution." "The mottled glasslike appearance of the root of a royal palm tree stabilized in epoxy forms the body of the base opposite. 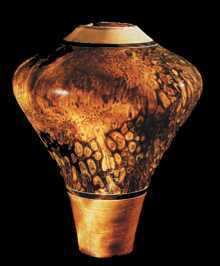 The piece also features a Guatemalan rosewood base, bands of Macassar ebony and birch veneer, and a naturally irregular rim of moose antler. Galen has no stock designs-each of his signed and numbered pieces is unique." In fact, Carpenter credits much of his accomplishment to his rural background and independent character. He grew up in a small town in Kansas. He worked as a printer ("I learned a lot about color"), then a self-employed contractor, and even-tually, as a furniture maker and restorer. "Restoring antiques was my education in design," he says. Meanwhile, "I started turning these bowls just for therapy, for a diversion. People started offering me money for them. I found it hard to believe. Then the Wichita Art Museum 'discovered' me. They're the ones that told me these things were 'vessels,' " he adds with some amusement. "I was right off the turnip truck." 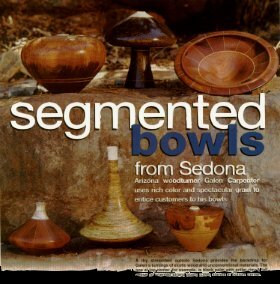 Like most turners, Carpenter started out turning one-piece bowls. "But the thing I always liked about furniture was the contrast of woods," he says. So he began gluing wedge-shaped segments of wood together to form wooden circles, which he interlayers with wood ve-neer, then turns. The assembly pro-cess is complex, so Carpenter must visualize from the start what the final product will look like. "I can look at a board," he says, "and see a bowl." Much of his genius is in deciding what form will make best use of a board's dimensions and grain, what cuts will show the best color and pattern, and what other materials will best combine with the featured wood. Many of Carpenter's pieces contain dozens of saw cuts, carefully planned angles, hairline glue joints, and several species of wood. Yet he constantly strives to produce simple designs that respect the natural patterns of his material. "If you let Mother Nature determine the form," he says, "the bowl will be beautiful. I cut the wood and design and shape the bowl to show what the wood is all about." Carpenter doesn't stain his work. "If you're willing to look hard enough for the right wood, Mother Nature has made the color you want," he says. To dozens of exotic wood species, he's added materials both precious and mundane. Some, like "chipboard," an inexpensive alternative to plywood, may never have been turned before. The same holds for the turquoise bands that appear on some of his work, and for the bone and antler rims that provide a pleasingly irregular lip to many of his pieces. Finally, there is his idiosyncratic turning technique. "Most turners have taken lessons," he says. "I learned by doing." Perhaps as a result, and because it better suits his highly refined style and difficult-to-turn materials, his method emphasizes fine, shearing cuts and precise control of the tool. He could avoid the risk altogether by leaving the pieces solid, but, he says, "I make them to be felt and picked up and touched. People expect a given form to weigh a certain amount. If it is too heavy, it doesn't feel right; if it's eggshell thin, it doesn't have the right heft. I leave a little bit of beef in the base so they'll sit better and balance well in your hand." Carpenter's sensitivity to feel is integral to his designs. He'll often hold his turning chisel in one hand and rest his fingers lightly on the spinning piece with the other as he makes his final cuts. When it feels right, he says, it is right. He encourages those interested in his work to pick it up. "Some people come into my booth with their hands behind their back. They're trying to physically restrain themselves from touching," Carpenter says. "I tell them to go ahead. The best designs are invariably the ones people want to hold."